On Feb 9 2010 Google launched its new product named “Buzz”. This is an integrated into Gmail Google social network, the primary purpose of which is provision of social networking capabilities to Gmail accounts. 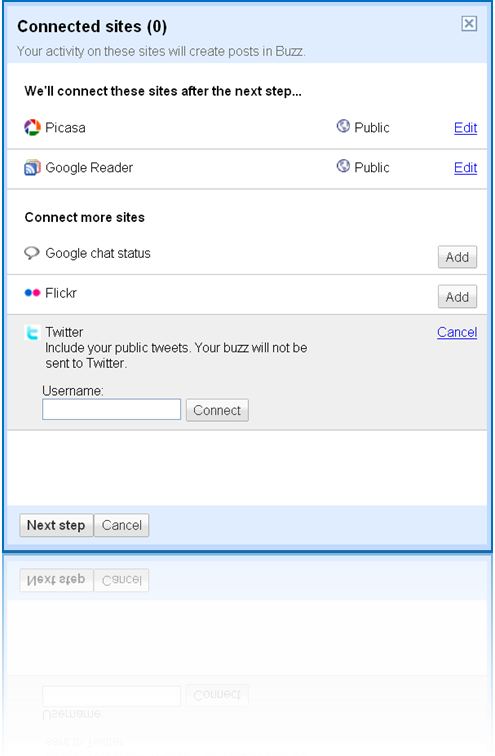 For any Gmail account holder social Buzz now appears as an additional option in their menu. As posted on Google Official blog, developers see a huge social network underneath Gmail. This vision is really reasonable, as Gmail services are not only free and very popular, but are also much interconnected. A great example of the linking and integration is a bundle of Gmail and Google talk, which let’s you chat to people you send emails to from your Gmail. 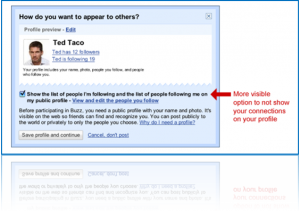 In this post you will find a brief Google Buzz review describing its distinctive features. Buzz social network has become very popular starting with the first moment of existence. On Feb 11, according to Google’s report, there were over 9 million buzz posts and comments made. That means that since its release the new service was used to create approximately 160,000 posts and comments per hour! Figures for mobile usage are quite impressive as well: 200 posts per minute. This is quite a statistics even for Google. Within the first two hours after the official start a special site button, similar to those of Digg and Twitter, was created. The special thrill of Google Buzz is the combination of Gmail, Twitter and Facebook features in one account. Using this new service you can create your public Google profile accessible from anywhere on the WWW. 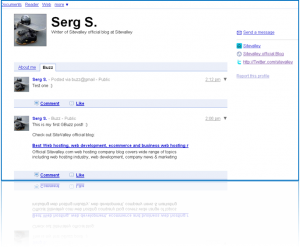 This profile is a summary of your personal, public and contact information. This is also a place where your Buzz posts are displayed (if they are public). Each profile is assigned a permanent link of the form “http://google.com/profiles/profilename”, where “profilename” is part of your email address that goes before “@gmail.com” (e. g. for address peter@gmail.com “peter” is the profilename). Any such personal page can be easily searched for in Google Search Engine (if you set the profile to be publicly available), which provides you with profile capabilities of Facebook, but places the content in the Web itself, rather than the specific social network. 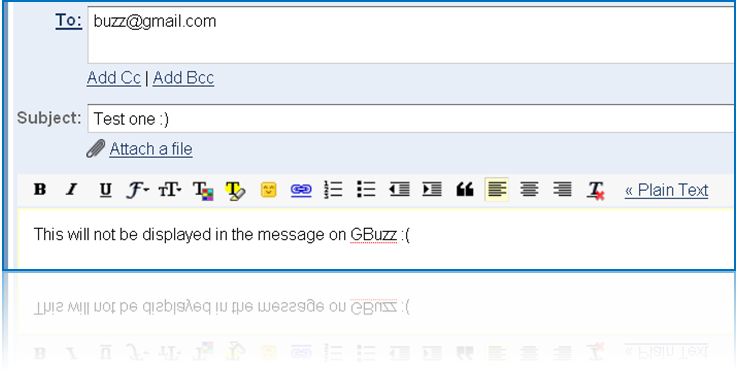 The Buzz updates work similarly to those on Twitter, but unlike the latter, they are not limited to certain amount of characters and allow attachments. Those of you who are familiar with Google Wave will discover that most of the linking capabilities implemented in it will work with Buzz, i.e. you can insert pictures or even entire blog posts via a single link. There are several very interesting features introduced in Buzz that are not present in other social networks. One of them is geopositioning, which allows showing the exact user location at the time of posting a message. 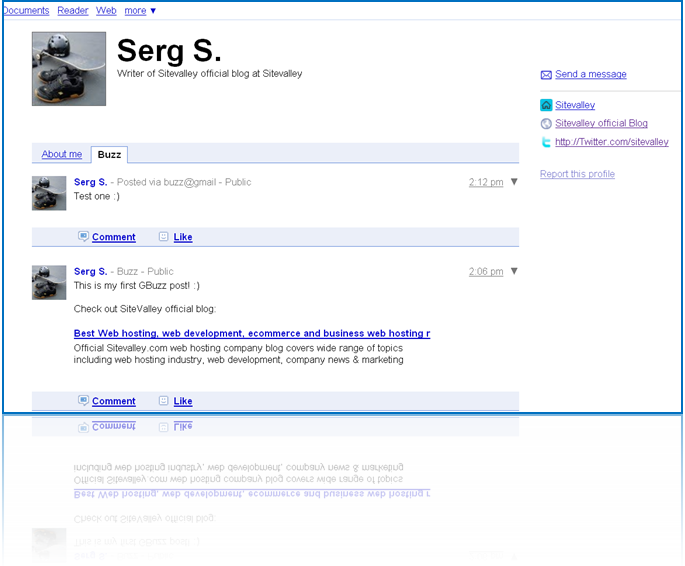 Appearance of public Google Buzz profile. Profiles are given links of the form http://google.com/profiles/profilename. 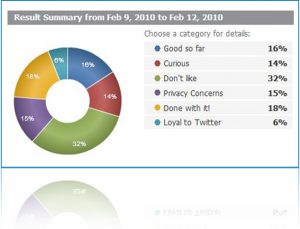 Immediately after the launch of Google Buzz there were numerous talks about privacy issues it brought. The combination the following three factors gave rise to such discussions: the new social service was initially configured to follow all of user’s Gmail contacts automatically; Google profile showed Buzz contacts a person was following; the equivalence of the Buzz and Gmail usernames. As a result numerous mail addresses became publicly available. Originally developers wanted to make the start easy for everyone who uses Buzz and this is why they configured automatic following of contacts. Users had an option to change to turn the automatic following off, but it was not easy enough for everyone to find. So it worked the following way: you started using Buzz and all you contacts were automatically added to the list of people you followed. 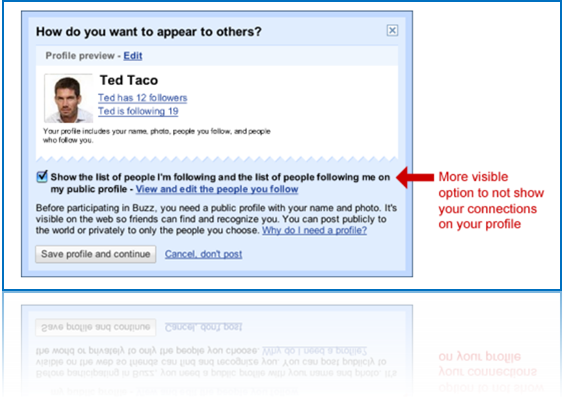 As most settings of Buzz were set to public by default, e-mail addresses of the users you followed were revealed. After receiving constructive criticism in regards to the automatic following by numerous users, Google has placed the special tick boxes in more apparent places to ensure that people actually do configure how they want to appear on the web before they start revealing any kind of information about themselves. The development team intended to go beyond regular status messages with Buzz. They created the new social network capable of sharing any kind of messages. The notification system is fully integrated into Gmail. You receive status updates and comments directly to your inbox and can control these messages using regular mail filters. Additionally, you can even post your own messages using Gmail. In order to post an update using e-mail, you need to send it as a message to buzz@gmail.com. The message should be send from a Gmail address your Buzz account is associated with. Content displayed via the mail post submission. Filter for the Buzz updates and notifications. 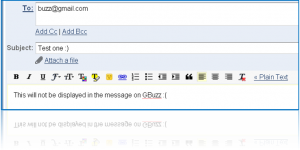 Google Buzz is automatically connected to every Gmail account, but there is more than just Gmail to Buzz! You can also connect several other popular services your might already be using. 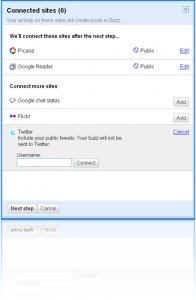 The current list includes: Twitter, Picasa, Google Reader, Google chat statuses and Flickr. Facebook is not available at the moment. Some believe (as for example in the post at informationweek.com and gizmosforgeeks.com ) that absence of such connection is directly caused by rivalry between the two. Others tend to discuss Buzz’s impact on twitter and social network as a concept in general (see the post at mashable.com and the one at singulatiryhub.com). Overall, the first impression after using Buzz is that it is revolving around the post updates the same way Twitter does. However, the types of content that can be included into the update, as well as the overall message sizes seem to be implemented better in Google Buzz from the functional point of view. The Twitter connection for Buzz allows pulling update statuses from Twitter and displaying them in your Buzz roll. But unfortunately the backward linkage is not available. Overall, a lot of people tend to find Google Buzz to be a very interesting and innovative product. Google developers made an outstanding attempt to gather all the best features and approaches from existing social networks and blended it together with the already existing society of Gmail accounts. At the same time numerous reviews and comments showed that there are still things to be improved. This particularly refers to the interface and privacy options. Google is on its way of introducing enhancements and fixes, some of which were already implemented (for example the fix for automatic following). The situation with Facebook and Twitter is a little bit unclear as of today. Hopefully, a healthy competition will lead to a decent level of services and wide list of features on all of these networks.